Those who read my blog know that I’m a big proponent of reading aloud to my kids. I’ve been doing it since they were too tiny to talk, and I’ll continue reading aloud to them until they ask me to stop. One of our goals with reading aloud is to expose them to more difficult works than they could read and understand on their own. 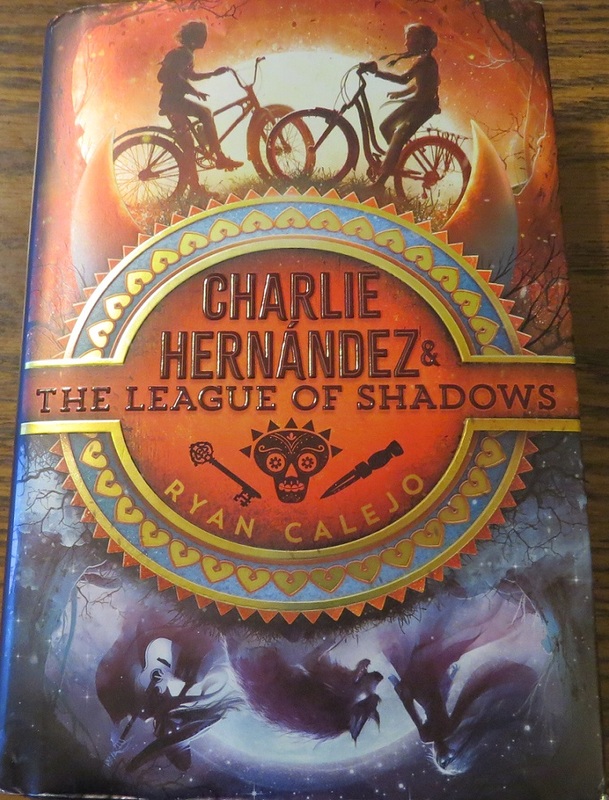 One of those that we recently read and enjoyed was Charlie Hernández & The League of Shadows by Ryan Calejo. Charlie is your typical middle school boy until the unexpected happens. His parents disappear and a fire destroys his house. When the story opens, Charlie is staying with temporary guardian, Mrs. Wilson, and Charlie’s world is no longer ordinary. Charlie starts manifesting a variety of ills including growing feathers, growing horns, and growing a lobster claw where his hand used to be. Charlie tries to hide these manifestations and go about his days, but he fails miserably. Luckily for Charlie, the school newspaper editor, Violet Rey, seeks to help Charlie and discover the truth behind the manifestations, his parents’ disappearance, and the fire. Together, they take an incredible journey and come face to face with many of the characters in Hispanic & Latino myths, legends, and folklore that Charlie’s grandmother used to tell him. He’s shocked to find that these mythical creatures are real, but thanks to his grandma, he’s able to not only recognize these characters but to fight them, saving his own life and Violet’s several times. This book is for kids ages 10 to 14 in grades 5 through 9. I opted not to read this to Cuddle Bug (8.5 years old) since she scares easily. Instead, I read this to PB & J Girl (10 years old), and when he was around, Bookworm (14 years old) listened in. Bookworm really liked the book, as was to be expected, because he’s a big fan of mythology. He had only previously studied Greek and Roman mythology, so this opened up a whole new world of mythology that he didn’t know about. PB & J Girl initially felt that the book was more for boys than girls because of some of the vivid descriptions of the evil mythical creatures, and I would agree with her on that part. I’m guessing most boys would love the gory descriptions, and maybe some girls, too, but not us. Luckily, these parts only came up a few times. However, once Violet Rey took an active role in the story, PB & J quickly became engrossed. I appreciate giving my kids multicultural experiences, and this book was the perfect way to do just that. Ryan Calejo has generously agreed to give one lucky reader a copy of the book as well as a $25 VISA gift card. To enter, simply state who you would like to give this book to. For an additional entry, follow Ryan Calejo on Twitter or Instagram, and leave a comment here that you did so as well as the name that you used. For an additional entry, follow Mom’s Plans on Instagram, and leave a comment here that you did so as well as the name that you used. This giveaway, which is open to residents of the U.S. 18 years of age and older, will end on April 6, 2019 at 11:59 p.m. PST. NOTE: I received one copy of this book in exchange for my honest review. No other compensation was given. I would let my kids share it because when one reads a book and enjoys it, they let the next one read it after they finish. My 10 year old daughter would probably enjoy this since she like mythology, too! My 8 year old son and 11 year old daughter are excited for this. Both of my grandsons, ages 11 and 14, would enjoy reading this. My best friend’s daughter would love this, so I would give it to her. I would love to give this book to my soon to be 7 year old daughter. She is quite the reader and loves to read out loud to her younger sister. It makes for wonderful bonding moments.